Perhaps inspired by how excited we got when Saturday Night Live mentioned us a few weeks ago, the venerable comedic institution or worst thing ever (depending on who you’re talking to) once again gave The A.V. Club a mention tonight. This time, it was in a trailer for an upcoming film about a triumphant Republican hero who stands up to Donald Trump and finally turns the tide against him. (Lord, let’s hope this doesn’t stay fiction for long.) 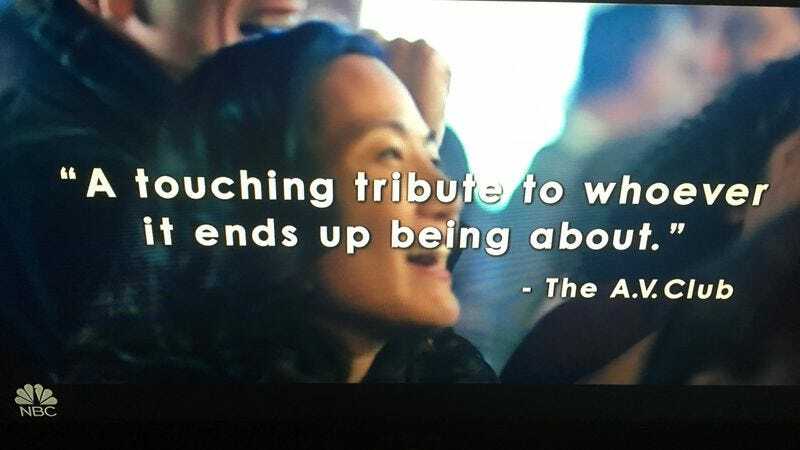 The quote, as you can see above, reads “A touching tribute to whoever it ends up being about”—The A.V. Club. That’s us! Is it pathetic that it gives our hearts a little flutter to see our name on TV, even though we’ve got our own TV show coming out in just 12 short days? Don’t answer that. We just want to be loved, is that so wrong?